Despite having just visited Las Vegas for the debut of Twist by Pierre Gagnaire, I was subsequently lured back by the promise of Masa. For the uninitiated, I'm talking about Masayoshi Takayama, chef/owner of his eponymous eatery in New York, widely regarded as the most expensive restaurant in the United States. Masa was born in Tochigi Prefecture, Japan, the second son among a family of five children. He was exposed to the restaurant industry at an early age, cooking and learning in his parents' catering company and fish shop. After graduating from high school, Masa moved to Tokyo, where he apprenticed at the legendary Ginza Sushi-Ko, starting as a dishwasher but eventually rising to the position of sushi chef. 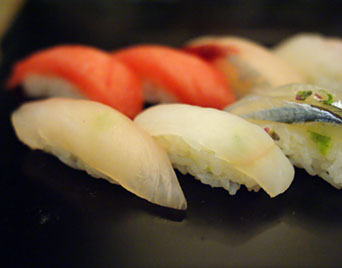 In 1980, Masa relocated to Los Angeles, finding employment at various sushi joints (Arado and Saba-Ya, according to Ritz Bites) before opening his seminal restaurant: Ginza Sushi-Ko (he had permission from the original to use the name). Masa's fame and reputation grew to immense proportions as the years flew by, and by 2003, the chef was ready to begin a new stage in his career. 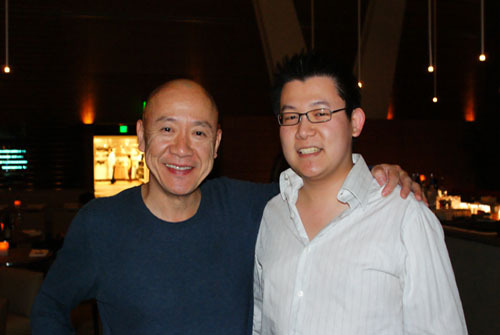 He sold his restaurant to his Sous Chef, Hiroyuki Urasawa, and moved to Manhattan, opening up Masa and Bar Masa at the Time Warner Center in February 2004. Interestingly, Masa opened up right next to Thomas Keller's Per Se, and anecdotally, it was Keller who finally convinced Masa to move. 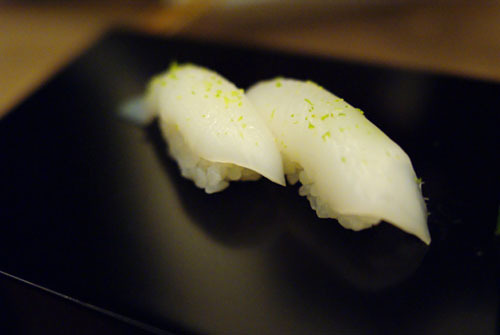 Masa quickly established a reputation as the top spot for Japanese in the City (as well as for its wallet-busting prices), garnering a four-star review in the New York Times, as well as a three-star Michelin rating. 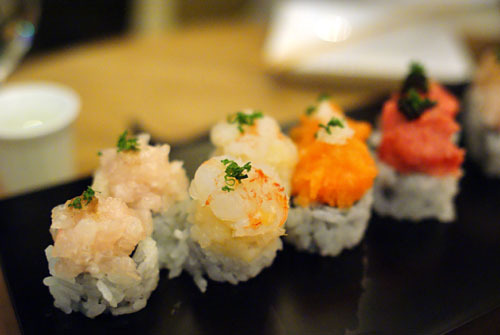 Bar Masa at Aria CityCenter, thus, is the chef's first expansion outside of Manhattan. For his Chef de Cuisine, Masa tapped New England Culinary Institute alumnus Drew Terp; Terp previously filled a similar role in New York, and has also toque'd at Alain Ducasse, Auberge du Soleil, and was head chef at Port O' Call Restaurant in Bermuda. The lead sushi chef is Takahiro Sakaeda. The space, not surprisingly, is far larger than what Masa had in New York (by a factor of about three). It's the setting for an ambitious undertaking--of bringing Masa's intimate style to a significantly larger stage. However, if it's intimacy that you seek, you can have that here, too. In addition to Bar Masa, there will also be a smaller dining room within called Shaboo. As the name implies, Shaboo will offer an omakase-only menu (the $500 price tag will surely frighten away the hoi polloi) featuring Masa's famous interpretations of shabu-shabu "hot pot" cookery, among other dishes. We'd originally planned to do Bar Masa and Shaboo back-to-back, but scrapped the plan upon finding out that Shaboo would only be opening toward December's end--perhaps we'll save it for next time. Set between the restaurants Sage and Julian Serrano, Bar Masa lies behind an intimidating set of massive, monolithic doors. A menu posted outside functions to further scare away the riffraff. Bar Masa's space is absolutely cavernous, colossal, cold. Beige leather banquets snake their way around the restaurant, punctuated by spare wood-metal tables. Copper and teak abound, while the ceiling sports an arched stairway contraption. A bar occupies one end of the room. Off to one side, we see the space reserved for Shaboo, featuring tables set with individual induction burners, underneath hovering ventilation hoods. Past Shaboo lies the massive kitchen. Note that there is no sushi bar (which I find somewhat strange, given that this is Bar Masa after all). 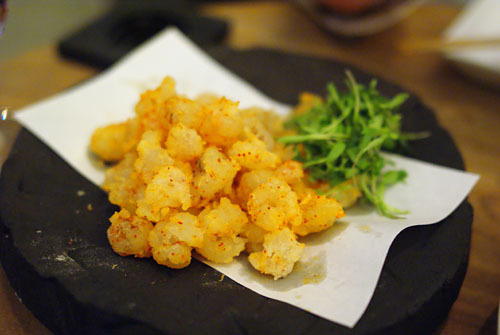 The menu features Masa's interpretations of Japanese comfort food, as well as some of his more fusion-focused creations. 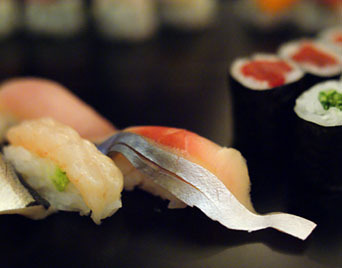 A selection of à la carte sushi and sashimi rounds out the menu. Omakase is not currently, and may never be, an option unfortunately. Click for larger versions. We began our meal with a nigori sake, basically unfiltered sake. The Crazy Milk, Oimatsu Shuzo, Nigori, Oita (300ml) [$16] was a prototypical example of the style: delightfully viscous, "rustic" even, with a pronounced sweetness. Our first course comprised five slices of sea bream sashimi, dressed in a tangy sauce, garnished with bitter greens, and topped with white truffle. It was fantastic, with the fish itself crisp, snappy, fresh, wonderfully balanced by its accoutrements. After I inhaled the heady aroma of truffle, the essence of the fungus made itself known in a big way on my palate. This then gave way to the mild, delicate sea bream, while the finish was delightfully tangy. A perfect amalgam of disparate tastes and textures. 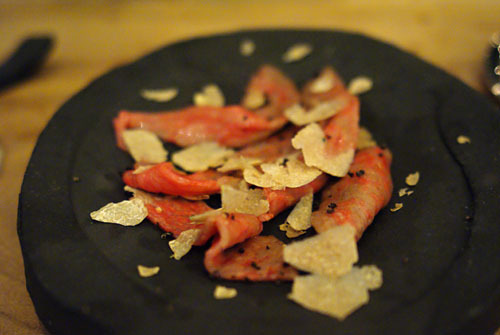 Ohmi is a type of wagyu beef, and expectedly, it was rich, fatty, tender, and unconscionably unctuous. Taken alone, it was quite flavorful, with a nice peppery tang on the midpalate. Eating the Ohmi with the truffle, I first noticed the immense gravity of the meat, which was then followed up by the distinct earthiness of the truffle in a long, lingering close. Very good. 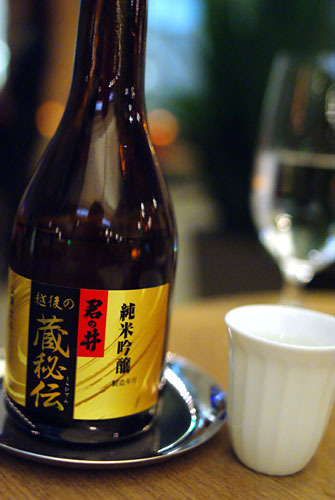 Our next tipple was the Kiminoi, Emperor's Well, Junmai Ginjo-Yamahai, Niigata (300ml) [$35]. A much more refined sake than the aforementioned nigorizake, it showed a lovely, bright acidity that really helped counter the richness of some of the heavier dishes. 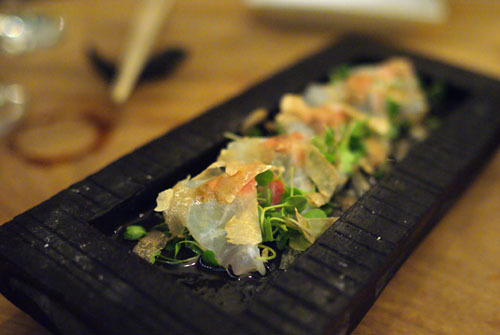 Kanpachi and Truffle - A strong truffle essence on the attack led to the crisp, fresh, essence of kanpachi. Very nice. Scallop and Shrimp - The shrimp and scallop combined to form a creamy, soft, subtly sweet admixture, while the finish possessed a great vegetal tang and crunch. My favorite. Salmon and White Onion - Here was a creamy tartare of salmon, with a soft smoky flair, effectively balanced by the pungency of onion. Tuna Tartare and Caviar - We finished with a luscious purée of tuna, mild in flavor and deftly accented by the briny tang of caviar. The roe was really the key here. Toro - Fatty Bluefin Tuna from Boston, Massachusetts. For some reason, the tasting comes with two pieces of toro, though I wasn't complaining too much. As expected, it was suitably fatty, oily, breaking apart easily upon mastication. Tasty, though not all that distinctive. Kanpachi - Amberjack from Shikoku Island, Japan. Firm, snappy flesh with a mild beginning but a much stronger close. My dining companion described this as "buri-esque." Tai - Sea Bream from Kyushu, Japan. We have that characteristic delicate natural of the tai, with a surprisingly robust finish. Nice. Kinme Dai - Snapper from Chiba, Japan. Supple and mild, with a wonderful, subtle sweetness. 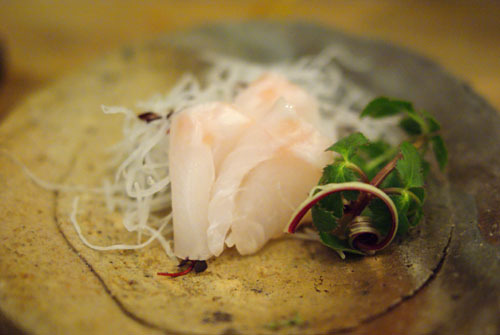 Hamachi - Young Yellowtail from Kyushu, Japan. Prototypical moderate hamachi character, with a nice spicy finish. Very good for hamachi (which I'm generally not a huge fan of). 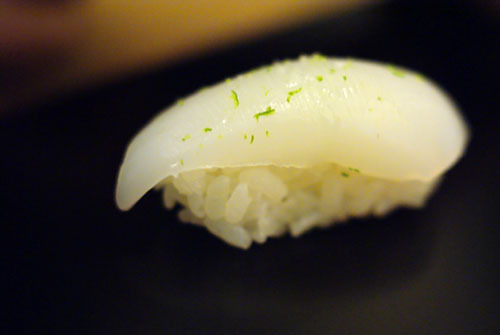 Hirame - Fluke from Wakayama, Japan. Creamy and mild. A strong example of hirame; note that it's not advertised as "halibut" like usual. Saba - Mackerel from Miyagi, Japan. The essential fishiness of mackerel was beautifully countered by the tang of shiso and heat of wasabi. Kohada - Herring from Chiba, Japan. 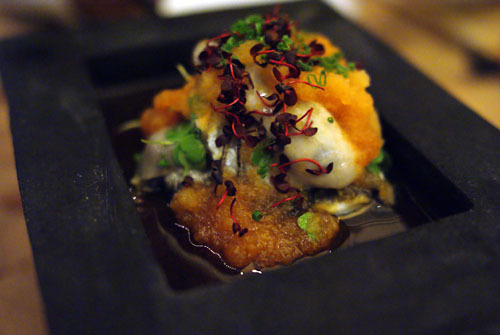 Very fishy, with that distinctive, firm kohada consistency. Amaebi - Sweet Shrimp from Ishikawa, Japan. Mild and creamy, with a marked wasabi finish. I would've liked a bit more snappiness though. Shimaaji - Island Jackfish from Wakayama, Japan. A beautiful cut of fish with its silvery skin, this was quite good, with just enough brininess and a pleasing texture. Overall, the sushi was of high quality, but unfortunately we didn't get to try it under optimal conditions, as the fish sat for ten minutes and subsequently dried out somewhat--definitely no 10-second rule here. The reason for this wait, depressingly, was that the various fishes served on the platter could not be identified. We asked our server, who was able to recount most, but not all, of the nigiri. He then called in the "experts," basically three older Asian women who were also servers at the restaurant. Unfortunately, they weren't much help, and the four staff members couldn't agree, bickering amongst themselves: Is this hamachi or kanpachi? Are you sure that's not mackerel? Do we have aoyagi in there? It was embarrassing, and sad. In the end, we made our own judgments as to what was what. It's pretty hard to mess up fried calamari, and certainly this tasted as it should, with a crispy outside leading into a nicely chewy interior. The slight heat from the pepper, meanwhile, was a great foil to the mild sweetness of the squid. Tasty and good for snacking. I had high hopes for this dish, but was let down. 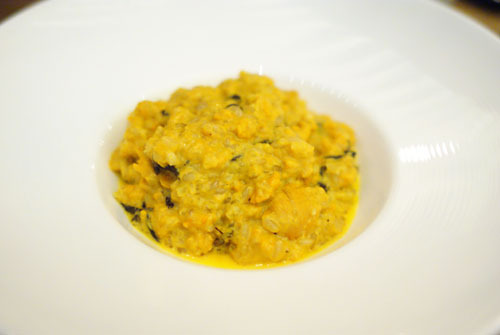 The sweet, briny essence of sea urchin was unfortunately muddled and lost here. And while I appreciated the earthiness and weight imparted by the mushrooms, they weren't enough to save the dish. I also felt that the rice was overly soft, and wanted a more "al dente" consistency. You can't really go wrong with popcorn shrimp, and this was no exception. I liked how the shrimp were crisp on the outside, but still had soft, creamy interiors, preserving the essence of the crustaceans. The sweet tanginess provided by the romesco (a pepper-, garlic-, and tomato-based sauce) was nice, but the key was the bitterness imparted by the greens. 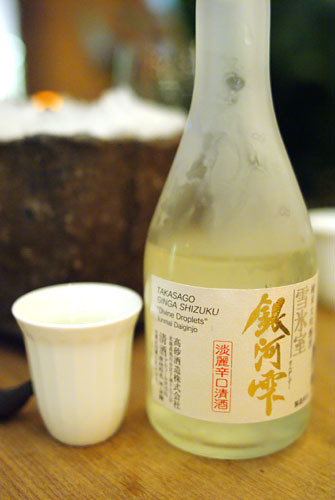 Our final sake was the Ginga Shizuku (Divine Droplets), Takasago, Junmai Daiginjo-Shizuku, Hokkaido (300ml) [$65]. 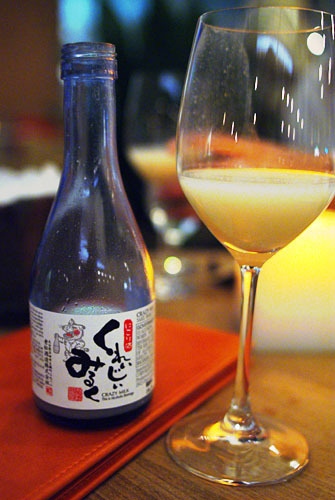 A shizuku style sake, it's made by allowing sake to drip freely from fermented rice solely under the influence of gravity. Indeed, it was a cleaner, lighter, more delicate libation, with appealing floral and fruity notes, backed by tinges of minerality. Next up were some of the largest oysters I've seen in a while--plump with a nice meaty consistency. They were mildly flavored, delicately briny, with their subtle sweetness accented by the tart citrus dressing on the attack, which led to a nicely tangy, slightly bitter finish. During the middle of the meal, Chef Masa came out briefly to greet us and sign menus. Fatty Deep-Sea Snapper from Chiba, Japan. 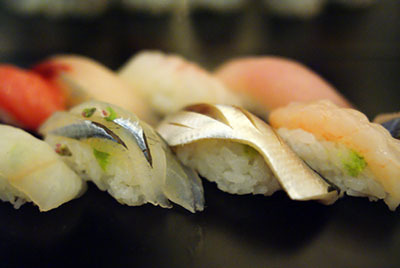 Here we have our first à la carte sushi selection, a soft, mildly-flavored, but surprisingly oily fish. My dining companion even compared it to a hybrid of tai and hamachi. Spear Squid from Kyushu, Japan. Gorgeously soft, chewy texture, with a light flavor accented by the tang of sea salt and the zest of yuzu, finished by the heat of wasabi. Very good. Octopus from Chiba, Japan. I quite liked the octopus here--sweet, supple, a canvas on which the earthy truffle could really sing. Lovely. 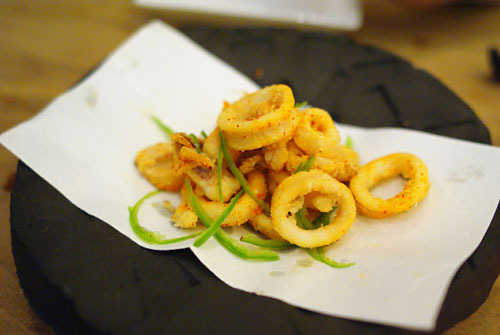 For some reason, the kitchen sent out an additional, singular serving of squid to our table. We were not charged for it. Obviously, we still had room for dessert, but unfortunately, only one was on offer. 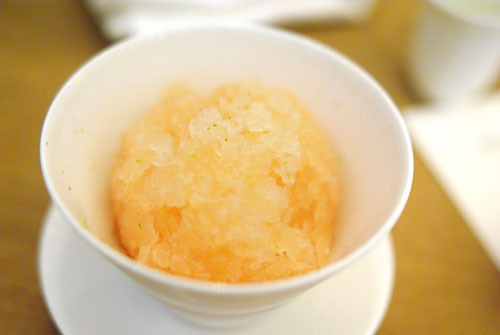 It was basically a grapefruit granita with grapefruit juice, Cointreau, and Grand Marnier: jarringly cold, but immensely fruity and refreshing, imbued with the pure quintessence of grapefruit. Taste-wise, it reminded me of Urasawa's excellent grapefruit gelée. I didn't get much of the alcohol, though. 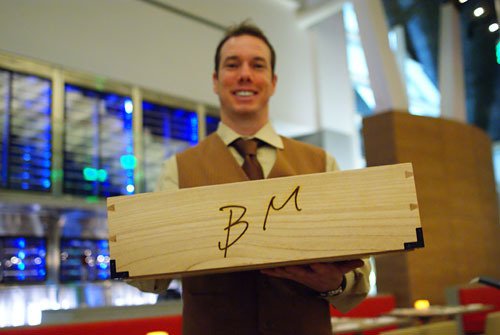 An interesting item of note is the wooden box used by the servers (designed by Masa himself, apparently), in lieu of standard serving trays. Food-wise, everything was mostly on point, save for the uni risotto. Despite getting somewhat desiccated amidst the confusion, the sushi was clearly of high quality, and generally quite good. A few items--I'm thinking the sea bream with truffle--were superb. My concern isn't the food though; it's the concept. The original Masa works--it's special--because the restaurant is a reflection of the chef himself. It's intimate, personal; it's supposed to let Masa's personality, his passion, his raison d'être shine through. This simply can't translate to Las Vegas--there's none of that here. Bar Masa in New York manages to straddle a middle ground because of its smaller scale, but what we have here feels like an upscale Nobu. 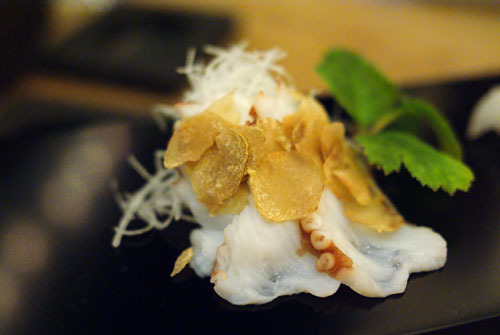 Have you notice the Bar Masa menu are 100% right out of the one in NYC but in a much small scale. In term of "restaurant size", will it make more sense the other way around. May be even create a menu more toword LV setting. Looks like you and Ryan had quite the dinner. Though it does look like the kaiseki menu was slightly disappointing. The atmosphere looked slightly cold as it seems to be more servers than customers. Did it ever fill up during the meal? I guess for the authentic Masa experience, we'd have to go to his restaurant in NYC.
" After the temperature drops below 14 F, they build an Ice Dome outside near the main kura building. It is basically an igloo inside of which the temperature stays about 28 F, with 90% humidity and no wind The low temperature means "nasty bacteria" cannot survive, and it allows them to make clean, pure, ultra-premium saké. Additionally, they separate the clear saké from the fermenting rice lees not by pressing, but rather by putting it into canvas bags and allowing the saké to drip out slowly overnight, with no pressure at all applied to the mash." Utterly unimpressed. Hopefully Shaboo will offer a better showing. 2) What could possibly be on an omakase menu that would make it cost $500! Maybe I'm wrong, but in reading your reviews, Urasawa seems like the pinnacle of omakase and that costs only $350.... What am I missing here?? dhkm: Yes, I noticed that the menus are very similar. I agree that perhaps it would be better to tailor it more to the setting. Danny: I wouldn't call the meal anywhere near kaiseki! The room is indeed too big, too sterile, and was never even close to being full. dhkm: I saw that about the sake too--interesting! FD: That's probably a wise choice, but I have my worriesabout Shaboo as well, especially concerning the ridiculous price. Jai: My fear is that it won't. Did you see the space? It doesn't look promising. Awsome reviews Kevin. I have been following your reviews for a few month now, and this is my first (sorry for the delay) You are fast~ I'm going to Vegas tomorrow. Looks like I'll save my money for Urasawa instead. Marry Chrismas! Thanks Ker! Where are you headed to in Vegas? merry christmas kevin! what a wonderful resport - and masa looks so friendly and happy. i liked his "best wish (singular)" signature :-) loved the post, but was floored when i saw the price tag on the beef tataki...that comes out to about $20 per slice, i'd figure? Well said, Evan. I agree. I just went to BarMasa on Jan 20. The lack of a bar is definitely a problem. At one point, I was served ALL of the sushi I ordered. 2 sushi samplers, sushi canape, unagi-s, anago-es and uni-s and the kobe beef hikiji roll and garlic chicken karaage...I felt so rush to eat everything. Luckily, the server, Chris (the guy in holding the BM box in your pic) saw that 2 of us were overwhelmed and took the chicken karaage away. Overall, it was a great dinner. Although a tad pricey to be their "practice guinea pigs"! We were also brought all our sushi at one time. It was rather overwhelming, and didn't allow the sushi to be eaten at optimal freshness. The intimate, personal interaction with the kitchen is really lacking--a bar would really help in that regard. Having been to both Masa and Bar Masa in NY, even though I knew the Vegas factor would be there, I was surprised by the immense space. Overall, the sushi was excellent. Amazing toro, toru suji, shimaaji, grilled kobe, etc. Sat at the bar. But the disconnect with a sushi bar and sushi chef left us missing something. Compared to the sushi place at the Wynn, though, this was far superior in terms of quality. Dan, good to hear that the sushi was on point. I actually felt the same way. The problem, though, is that the place is overpriced for the experience. I guess Vegas still lacks a reliable sushi joint. She totally stole your post.